To start a conversation with a user from your list, follow these steps. Right-click their user name and click Start Conversation. Start entering their user name on the keyboard, make sure it is selected in the list, and then press ENTER. 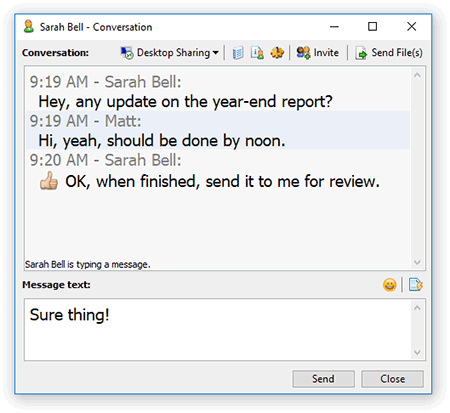 Each of the methods results in the Conversation window appearing on your desktop. 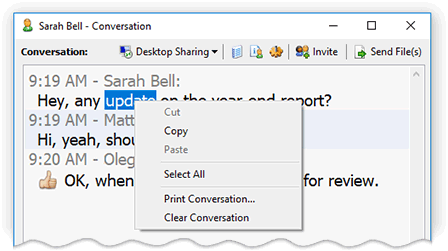 Conversation history with the selected user is displayed in the upper part of the window. 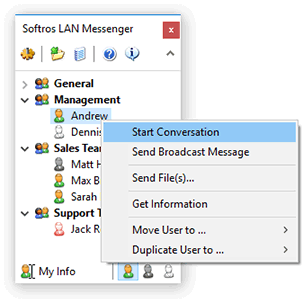 Whenever you start a conversation with a user you have contacted before, Softros LAN Messenger by default shows the last 30 messages you exchanged. This option can be disabled by unchecking the corresponding check box on the Messaging tab in the Settings dialog box. Right-clicking the Conversation text box gives you access to two additional options. Print Conversation – prints out the conversation you are having at the moment. Clear Conversation – deletes conversation and status history from the Conversation text box. The following buttons are found on the toolbars of the Conversation window. Desktop Sharing – displays a list of remote assistance options. In certain cases this button may be disabled. For more information, visit the Desktop Sharing section. View User History – loads message history for the user you are exchanging messages with at the moment, or opens the folder storing group conversation logs if you are having a group conversation. Get User Information – opens a dialog box with detailed information about the user you are exchanging messages with. The button is disabled if you are having a group conversation. Messaging Settings – accesses the Messaging tab in the Settings dialog box. Invite Users to Conversation – opens a dialog box with the list of users you can add to the conversation you are currently having. Emoji – opens a floating window containing several tabs of available emoji. To add an emoji to your message, just click it in the window. This button is disabled if the recipient uses an older version of Softros LAN Messenger that does not support emoji. Quick Messages – displays a list of preset messages.